Take the Fremont Street exit to Mission Street and turn left onto Mission Street, then turn right at Third Street and as you cross Market Street, get in the left-most lane and turn left onto Geary Street. Stay on Geary Street and as you cross Stockton Street, Union Square Park will be on your right hand side and Macy's on your left. You can either park in the Union Square Garage, beneath Union Square Park or find more parking choices. After crossing the bridge, proceed to the Lombard Street exit, follow Lombard to Van Ness (101 south), go right on Van Ness, continue on to O'Farrell Street, Take a left on O'Farrell Street. When you cross Powell Street, Union Square Park will be on your left and Macy's on your right. 7th Street exit, 7th Street north to McAllister Street and make an immediate right onto Leavenworth Street. Stay on Leavenworth until O'Farrell Street where you will turn right and continue until you cross Powell Street and Macy's will be on your left and Union Square Park will be on the other side of Macy's on Geary Street, parallel to O'Farrell. You can either park in the Ellis & O'Farrell Garage or find more parking choices. Exit 6th Street, continue on North on 6th Street to Howard Street, go left on Howard one block, at 7th Street go north to McAllister Street and make an immediate right onto Leavenworth Street. Stay on Leavenworth until O'Farrell Street where you will turn right and continue until you cross Powell Street and Macy's will be on your left and Union Square Park will be on the other side of Macy's on Geary Street, parallel to O'Farrell. Take BART to the Powell Street exit in San Francisco. 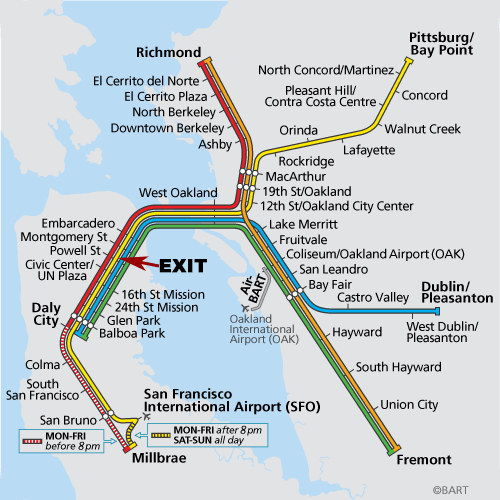 (see map and arrow above) No matter which BART train or direction you come from you will take the Powell Street exit and when you get off the train, look for the signs to exit BART. If you want to go closer to the Union Square Park or Macy's, Saks, Neiman Marcus, Barneys, etc. 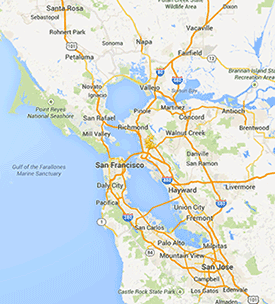 then take the exit that says either Ellis Street, Stockton Street or O'Farrell Streets. If you want to go to Westfield San Francisco Centre or Bloomingdales or Nordstrom, you are directly below it and look for the signs that say either Halide Park or Westfield San Francisco Centre. If you take the wrong stairs or trajectory out of BART, don't fret. You may just have to walk a little bit to get to where you are going but it will be a short walk. It can be pretty dis-orienting coming out of the BART underground. Don't be shy about asking someone who is a seasoned BART rider for help. For more BART information regarding schedules, fare calculators, check out our How to Get Around section. The San Francisco Caltrain last stop into San Francisco is at 700 Fourth Street. 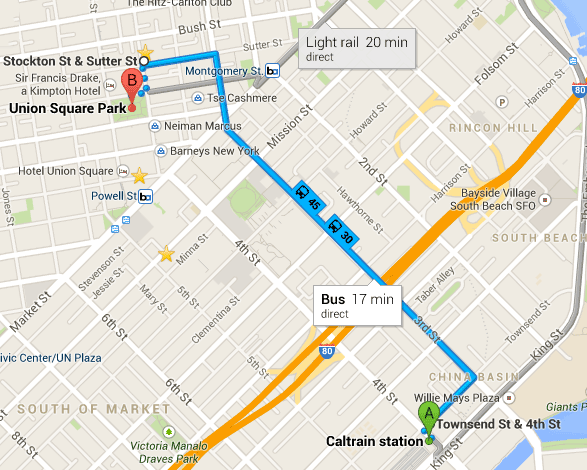 Once you debark from the train, two buses give you the most direct and expedient route to Union Square. 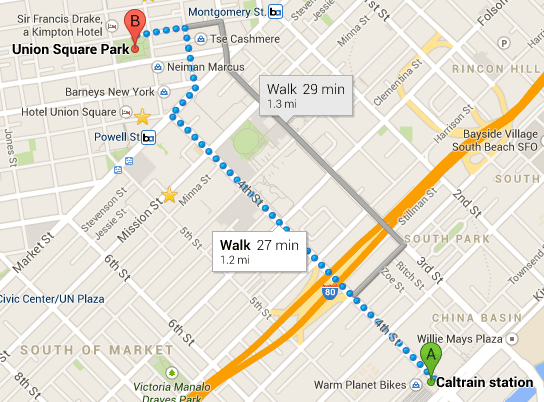 It is also possible to walk to Union Square. Click on the button of your choice below to get directions and current information as well as fares. Most hotels charge from $70 to $120 per night to park your car. For just about everything you would want to do in The City of San Francisco - you can take a cab very inexpensively or use public transportation which consists of muni tolly cars, cable cars and BART (Bay Area Rapid Transit). Rent a Car in San Francisco - For those things you might want to do outside the City proper, you can often get there by BART but if you did need a car, it is a much better option to rent it from many choices very near your hotel and in some cases within your hotel for the day. Visitors often do what is typical for almost every other city in the U.S. except New York and rent a car at the airport. Unless you are willing to spend about a hundred dollar a night for your rental car and then throughout the city, struggle with parking - wait until you get to your hotel to decide to rent a car for your trip! The hotel concierge can be very helpful in giving you advice.